Competitiveness at the expense of equality? Working time has made its appearance in the presidential campaign, and the idea that people work less in France than elsewhere is gaining ground. This is the subject of a report by COE-Rexecode, which unfortunately does not take into account the sexual division of labour. The employment policies being implemented by European governments are not, however, gender neutral, and ignoring this gives a distorted view of the reality of how work is divided up in our economies: an integrated approach to equality (or “gender mainstreaming”), which requires thinking about the differential effects of public policies on women and men, is far from automatic. The counteranalysis to the Coe-Rexecode report proposed by Eric Heyer and Mathieu Plane emphasises the importance of not just looking at full-time workers when trying to compare working hours and their impact on the labour market dynamics of the major European countries. Indeed, part-time workers represent 26% of all employees in Germany, against 18% in France, so it is misleading to exclude them from the analysis. It is well known that the distribution of full-time and part-time jobs is gender-biased: throughout Europe, women work part-time more than men do. While in France about 30% of women employees work part-time, the rate is 45% in Germany, and in both countries the part-time rate for men is below 10%. The gendered nature of part-time work is a factor in inequality: recall for example that in France working time explains about half of the wage gap between men and women (see in particular Ponthieux, Meurs). The issue of working time is central to the promotion of occupational equality. According to the methodological note to the Coe-Rexecode report, “The annual data provided by Eurostat and published by Coe-Rexecode in the paper, “La durée effective du travail en France et en Europe” |“Average effective working time in France and in Europe”] are the only data on average annual hours of work that is comparable between European countries.” It is unfortunate that in its order to Eurostat, Rexecode did not see fit to ask for a gender breakdown of its data. This would have provided a cost-effective way of determining trends in working hours by gender in both countries. Despite this omission, is there anything that can be said about changes in working hours from a gender perspective in the two countries during the last decade, based on the data available to us? How were the adjustments in the labour market divided between women and men? The changes over the period studied are instructive in terms of the employment policy approaches adopted in the two countries. In the early 2000s, the introduction of the 35-hour work week in France put an end to the reductions in charges that had made hiring part-time workers attractive and which had been driving the ramp-up of part-time employment in France, without significantly affecting the employment conditions of men. 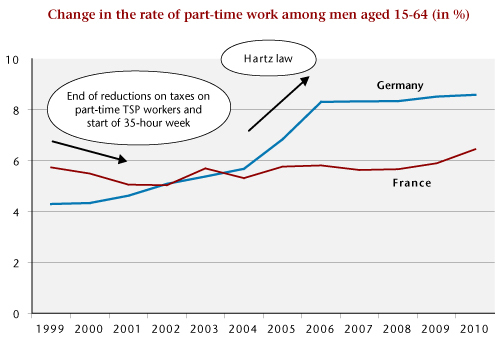 Since then, the rate of part-time employment has been stable for women as well as for men (see figure). 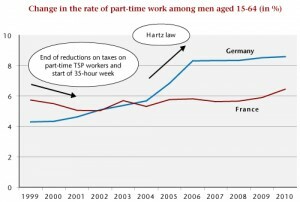 In Germany, the implementation of the Hartz law (effective as of April 2003) introduced “mini-jobs” , which basically meant the creation of part-time precarious employment. This affected both men and women, but while the part-time rate of German men rose by 4.3 points, the rate of German women rose by 8.2 points (Figure). 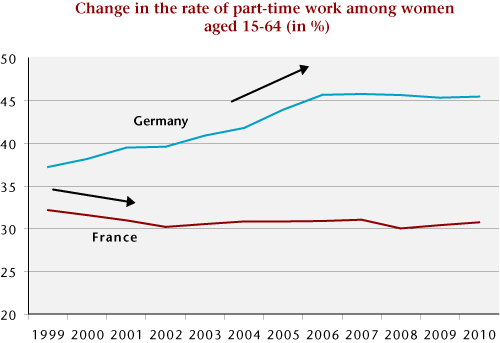 German women were thus significantly more affected by part-time employment than were German men, or French women. Furthermore, the average working time for part-time jobs was slightly over 4 hours less in Germany than in France (according to the Eurostat data). French women were of course more affected by the increase in part-time work than were French men, but this increase has been limited, since new part-time jobs accounted for only 21% of the total jobs created between 1999 and 2010. In contrast, in Germany, part-time work has been the driving force in employment during the period, with German women being the main ones concerned by the individual reduction of working time: they represent 70% of the battalion of part-time workers added during this period. Thus, not only did France create more jobs than Germany between 1999 and 2010, but the choice of a collective rather than an individual approach to reducing working time led to a more balanced distribution of employment between men and women. ← Working hours and economic performance: What lessons can be drawn from the Coe-Rexecode report?